When it comes to theme developers, it is sometimes hard to choose the right one. All of them promise impeccable quality and functionality but unfortunately, you don’t always get what you’ve bargained for. Many developers out there try to create as many themes as possible, without paying extra attention to each theme individually, and the ending result is: they all look the same, and none of them really stands out. Symphony Themes do their best using all the right modules for creating attractive, quality themes you really need to check out. They don’t offer hundreds of them, they rather focus on quality than quantity and you can be sure each one of their themes was created carefully and professionally, regardless of the theme niche. If you need a restaurant theme for Drupal, SymphonyThemes might be the right choice for you. When you run a restaurant it’s important that the theme you choose for your website is attractive and eye catching. This developer doesn’t only offer beautiful themes, they also make them easy to run and maintain. You don’t have to be a professional web designer to use one of these themes. 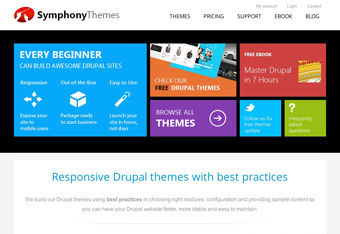 When you purchase a theme at Symphony Themes, you will get a fine combination of a Drupal Theme and Drupal core with great modules added and sample content, all in one package. No need for extra payment and hiring a professional to do the work for you, you will be able do it all by yourself. SEO is a very important element of every website. This developer creates themes that contain all the right on-site SEO tools for super boosting your traffic. If all this functionality isn’t enough for choosing this developer, the fact they have a 30-day satisfaction guaranteed policy should keep you calm and ready to try them out!